Apart from the assumption that facial beauty is a subjective thing, but, it still has a scientific aspect, which is universal and scalable, and can embody a facial beauty itself. These aspects are the Golden Ratio, Fibonacci Number and Golden Spiral. In simple terms, the Golden Ratio is an ideal ratio which is denoted by φ (Phi). And Phi is represented by an irrational number, 1,618. This number then becomes the benchmark in determining a measure, which requires two variables. A simple example: If You will create a rectangle with a horizontal line of 10 cm, How many centimeters are needed for the vertical line, in order to produce a proportional rectangle?. Then, divide the horizontal line of 10 cm with 1,618, the result is equal to 6,18 cm for the vertical line. And all proportional shapes around us, its ratio is always close to Phi or 1,618. And this is a scientific proof, which can not be rejected by common sense. By definition, the first two Fibonacci numbers are 0 and 1, and each remaining number is the sum of the previous two. Some sources omit the initial 0, instead beginning the sequence with two 1s (Wikipedia's Fibonacci Number). 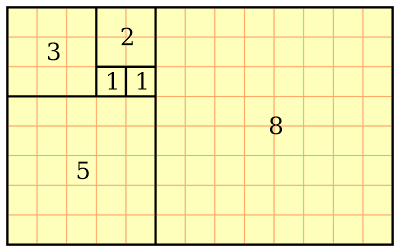 Then, what is the scientific linkage between the Fibonacci Numbers to the Golden Ratio?. Observe the row of numbers above, then divide 3 by the previous figure, namely 2. Then divide 5 by 3, divide 8 by 5, and so on by the same method. All of the distribution of those numbers, will result in or very close to 1,618. Or close to the Golden Ratio or Phi. That is, the Fibonacci Numbers clearly represents a proportionality. Referring to the Fibonacci Numbers, then generate a combined squares, as shown in the picture of Fibonacci Blocks above, a tiling with squares whose sides are successive Fibonacci Numbers in length. By itself, the Fibonacci Blocks is a form of proportional, eye pleasing, or beautiful. Starting from the aspects of the Golden Ratio, then Fibonacci Numbers and Fibonacci Blocks, eventually led to the Golden Spiral. As Wikipedia interprets, in geometry, a golden spiral is a logarithmic spiral whose growth factor b is related to φ, the golden ratio. 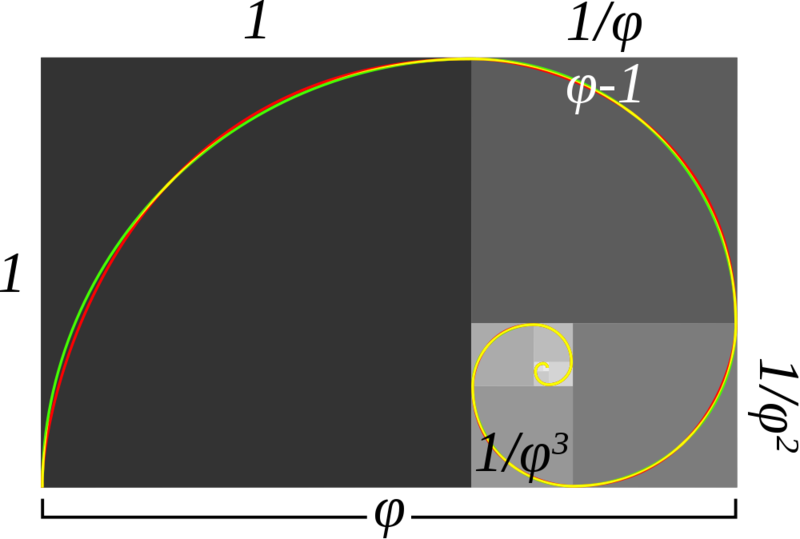 Specifically, a golden spiral gets wider (or further from its origin) by a factor of φ for every quarter turn it makes. Exactly, most relevant features to the Golden Spiral are Curved Features. So, the Golden Spiral also termed by some people as the Golden Curve. Scientifically, the process of designing the Golden Spiral, or Golden Curve, is very trace, systematic and measurable, which starts from the Golden Ratio. The Golden Spiral above, represents only 6 Fibonacci numbers (1,1,2,3,5 and 8), but at least, it have designed 9 spirals or arches or curve features. And each spiral or a curve is definitely proportional. It's definitely beautiful. 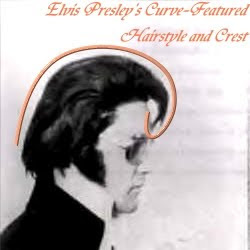 Curved features, found in insects such as snails (an animal created by God with so unique), the shape of human ears, eyebrows, cupid's bow on human lips, wavy hairstyle, Grace Kelly's facial features, Aishwarya Rai's big eyes, Elvis Presley's hairstyle and crested (which has been heartbreaking millions of girl), and much more. 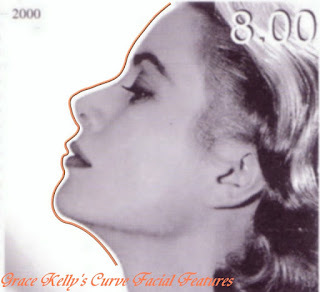 In essence, curved features on the face are basic elements for woman facial beauty. Image sources: Golden Spirals on Wikipedia authorized by Mattes/Parking, Fibonacci Blocks on Wikipedia authorized by Borb and Public Domain's Grace Kelly and Elvis Presley on Wikimedia. How To Make Homemade Mask For Face Skin? Penélope Cruz Is A Motherly-Faced Woman? What Kind Of Face Shape Does Aishwarya Rai Have? Why Does Face Shape Become Important?